My friend Rudi Stuber gave me the opportunity to meet prof. Karl BURRI (1921-2003) in Bern a few years ago. 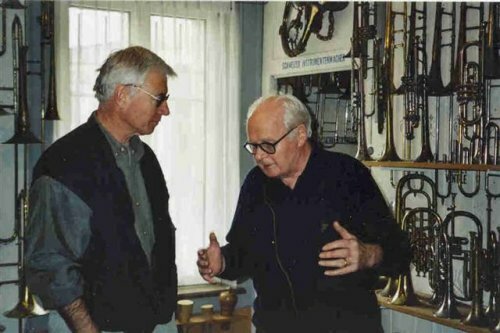 Prof. BURRI was a swiss trumpet high-technician who has collected wind instruments for over half a century. Only him could find the defaults and qualities of any trumpet in a twinkle of an eye. His fabulous collection, masterpiece of all his life, can be seen in Zimmerwald, Bern Canton, Switzerland ** . Here, you will see the most beautiful wind instruments collection i've ever seen in the world. Professor Burri died a few years ago but this good man and exceptional artist is still in our hearts, forever.